The Gold Medal Award is the highest national award that a parks and recreation agency can receive, given by the American Academy for Park and Recreation Administration (AAPRA), in partnership with the National Recreation and Park Association (NRPA). With this honor, the Hoffman Estates Park District has demonstrated itself as the best parks and recreation agency in the country for a community with a population between 50,000 and 100,000. The most prestigious award of its kind, the Gold Medal Award honors communities throughout the United States that demonstrate excellence in long-range planning, resource management, volunteerism, environmental stewardship, program development, professional development and agency recognition. CAPRA accreditation is the only national accreditation for park and recreation agencies and is a measure of an agency’s overall quality of operation, management and service to the community. This mark of distinction indicates that an agency has met rigorous standards related to the management and administration of lands, facilities, resources, programs, safety and services. What’s more, HE Parks is one of few park districts to achieve a score of 100% in all of the category standards and the first to submit all required document completely electronically. As part of the accreditation process, HE Parks had to demonstrate compliance with 155 recognized standards and document all policies and procedures. Often the process helps identify efficiencies and heighten areas of accountability, all of which translate into higher quality service and operation to benefit the community. This accreditation is awarded to Park Districts by the Illinois Association of Park Districts and the Illinois Parks & Recreation Association. It is granted to those that work toward improving the quality of life for Illinois residents and to recognize those agencies that provide exceptional Park and Recreation services to their community through a voluntary, comprehensive, professional accreditation process. 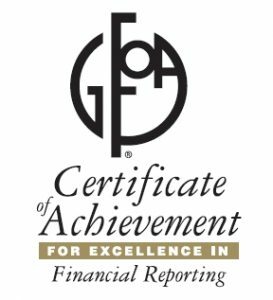 The Government Finance Officers Association (GFOA) of the U.S. and Canada has awarded the Hoffman Estates Park District (HE Parks) with a Certificate of Achievement for Excellence in Financial Reporting for its comprehensive annual financial report (CAFR). The certificate is the highest form of recognition in the area of governmental accounting and financial reporting and represents a significant achievement by the HE Parks and its management. In addition, an Award of Financial Reporting Achievement was granted to Craig Talsma, deputy director/director of finance, as the person primarily responsible for the preparing the award-winning CAFR. CAFR recipients are determined by an impartial panel of GFOA representatives that selects organizations that meet the high standards of the program and demonstrate a constructive “spirit of full disclosure” to clearly communicate their financial stories. GFOA is a nonprofit professional association located in Chicago and Washington D.C. that serves 17,500 government finance professionals. To achieve the PDRMA Accreditation, HE Parks had a thorough review by PDRMA’s Risk Management Consultants to evaluate, develop, maintain, and enhance risk-management best practices. The review includes a minimum of three visits to the member location over the course of the year. HE Parks is proud to congratulate its partner AMITA Health in winning the “Best Friend of Illinois Parks” award in the Large Business category from the Illinois Association of Park Districts (IAPD). The honor is awarded to a business or corporation that has demonstrated exemplary support to a local park district, forest preserve, conservation, recreation or special recreation agency. Awards are given for three subcategories, small (fewer than 100 employees), mid-sized (100 to 500 employees) and large business (more than 500 employees). 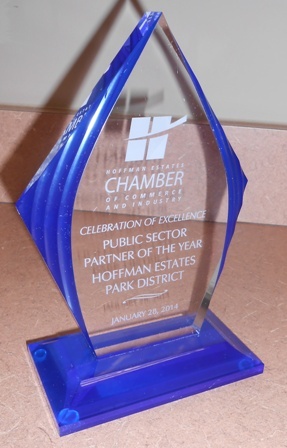 The park district won the distinction of Public Sector of the year in 2013 and 2015 from the HE Chamber of Commerce. The award is determined by a vote of chamber members. Seascape received the 4-Star Quality Award from Starguard Aquatics Institute. 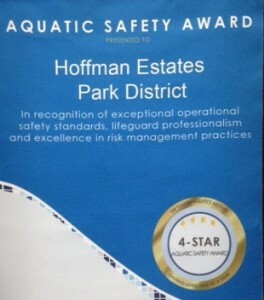 This Recognition is given to facilities exhibiting excellence in safety and lifeguard professionalism. The Helen Doria Arts in the Park Award is granted by the Illinois Art Alliance to park districts in Illinois that promote the arts in their communities. HE Parks won the award in part due to its joint partnership with the Hoffman Estates Arts Commission and the Village of Hoffman Estates, in which we offer the Summer Sounds on the Green and Friday Fun in the Park entertainment series. Best Green Practices 2017 – Awarded by the IAPD to park districts that have taken the initiative to incorporate and encourage environmentally-friendly business practices and policies. The Hoffman Estates Park District received the “Illinois Sunshine Award” from the Illinois Policy Institute, a nonpartisan research organization, for its efforts toward online transparency and government openness. The Sunshine Award is granted to government organizations that score 80% or higher on the instituted 10-Point Transparency Checklist. Only 50 out of 7,000 governing bodies have won the award. For more information, visit the Illinois Policy Institute. Awarded to Illinois Parks and Recreation agencies who are recognized as being exceptional places to work. This is a 5-year recognition award. The Hoffman Estates Green Business Recognition program is designed to assist local businesses to achieve their energy and environmental goals, to recognize businesses for their small and large “green” efforts, and to educate the community about opportunities and benefits of improving our economic sustainability. Proclamations are issued for civic celebrations; organizations and individuals; significant events; and individuals who have made a significant contribution to Hoffman Estates.